Storing huge amount of data on your PC sounds great! Saving all the pictures you took with your friends, capturing every happy memory, trending music and basically everything. But..what sounds horrifying is, losing it! which usually happens in real life that’s why backing up data is considered an exceptional way of preventing it. There must be some files you don’t wanna lose at any cost. For that, all you need to do is back up your data on regular basis. Now, you all must be thinking there would be perplexing ways of backing up. Let me make it clear, they are as simple as learning ABC! Here, you’ll learn which method is right for you and what files you really need to back up. BACKING UP PERSONAL DATA like photos, videos and whatever you hold dear is essential. Other than that, operating system can be downloaded again if your hardware crashes but if you lose your personal data it will be long gone! If you own an external USB drive, you can easily back up your data to your drive using your PC’s built-in back up features. If you have Windows 10 or 8, use File History. If Windows 7, use Windows back up. On Macs, use Time Machine. Plug in the drive whenever you want to back up your data or keep it plugged in and your data will be backed up automatically with the help of that backing up tool that you are using. It is a very convenient and easy method to back up your personal data. To make sure your files are secure, you can save them online by using services like BackBlaze. It is a famous way for backing up data online and is recommended by a lot of people. Carbonite and MozyHome are also effective for backing up purposes. These services run on our PC in the background and save each file to the service’s web storage. Monthly fee for these services can be around 5$ a month. This method is safe as our data is secured online and in case of any natural disaster or hard drive failure our data would be protected. Though, this method is kinda expensive so most of the people don’t use it. Although, critics say that this naturally isn’t a back up method but for regular use it serves as that for most of us. Instead of storing your files on PC you can store them on services like Dropbox, Google Drive, Microsoft OneDrive,or a similar cloud storage service. These services will automatically save your data and if unfortunately your hard drive crashes you’ll still have all your important files saved online. This method is relatively easy and famous as it is cost free and saves up time but these storage services only allow certain amount of files to be saved on them so its of no use if you have to save huge number of files. To ensure your files are safe, use more than one Back up method. At least, two. As you need both “Onsite” and “Offsite” backups. “Onsite” literally means backups stored at the same physical location as you. “Offsite” backups are stored at a different location. Onsite backups are easier and convenient. In case of any data loss, you can restore files in no time from an external drive. But this alone isn’t enough. If unfortunately your house burns down and you lose your external drive, you’ll lose all your data. For Offsite backups you need to store your data on an external drive and then keep it safe in a locker or at your friend’s place. It may sound inconvenient but it is worth it to keep your precious files protected. 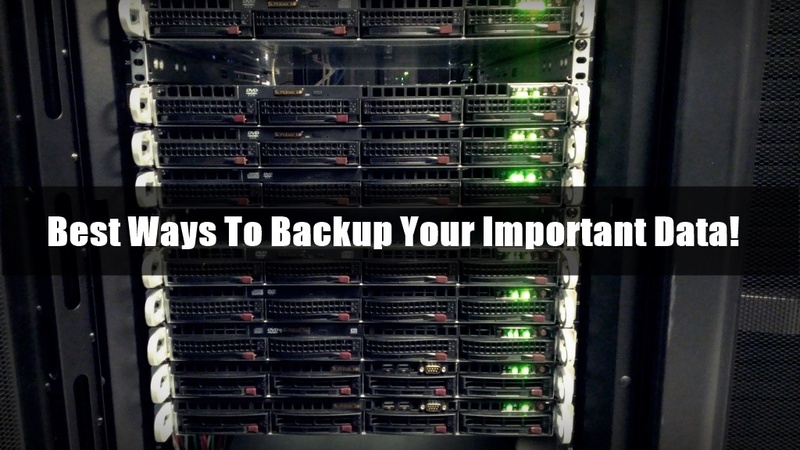 Online backup methods can also be used to keep your data protected as mention before. Some of those services include Dropbox, Google Drive, or OneDrive. Using these methods you can ensure your safety. These methods are very easy and convenient and can save you all from losing your valued files.